This paper addresses issues of causal direction in research on subjective well-being (SWB). Previous researchers have generally assumed that such variables as domain satisfactions, social support, life events, and levels of expectation and aspiration are causes of SWB. Critics have pointed out that they could just as well be consequences (Costa and McCrae, 1980; Veenhoven, 1988). In some contexts this has been referred to as the top-down versus bottom-up controversy (Diener, 1984). The main purpose is to propose a general statistical model which holds promise of resolving this controversy. The model can be used when three or more waves of panel data are available. 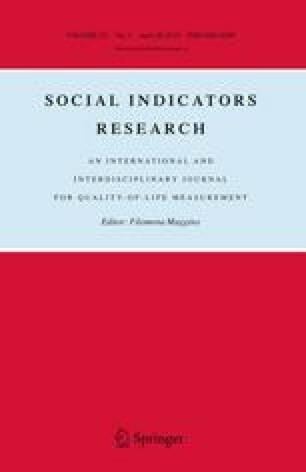 It is used here to assess causal direction between six domain satisfactions (marriage, work, leisure, standard of living, friendship and health) and SWB. Data are drawn from four waves of an Australian Quality of Life panel survey (1981–1987) with an initial sample size of 942. We particularly thank Ronald C. Kessler of the University of Michigan for his advice on statistical issues. We are also very grateful for comments from Frank M. Andrews of the University.of Michigan and Mariah Evans and Jonathan Kelley of Australian National University. Constructive comments from an anonymous SIR reader also led to significant revisions.